It is deep into the night, as Furuichi is intensively reading his book and Oga is slowly taking his, shower, aware of everything that is happening outside of his house. He suddenly hears a noise, sees a figure outside, and *WHACK* opens the window to see Shiroyama looking at him on a side note: That’s just creepy. Shiroyama takes him to a place where Kanzaki and Himekawa are waiting. Both have gone against Tojo to try and get their comrades back, only to lose badly against his sidekick and then run back to Oga because they want him to beat Tojo. Oga reluctantly agrees, and meanwhile Baby Beel still suffers his huge fever which causes him to still suffer from the inside Poor lil’ baby 🙁. 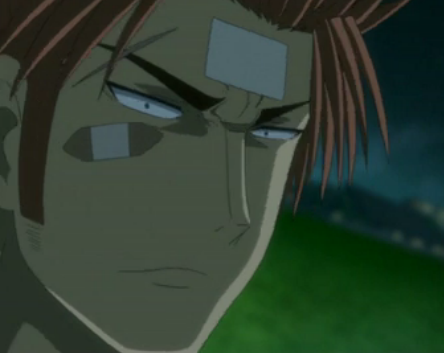 A big part of the episode consists mainly of boring fights and pointless scenes, except maybe when Kunieda showed up which was awesome because Kunieda owns and demonstrated that she was joining the team as well.Once Oga finally reaches Tojo, Baby Beel looks at him, recognizes him, and finally the link between them is back and Baby Beel feels better right away! The episode ends, and next week we will finally see the long awaited battle between Tojo and Oga the real one this time. I’ll be straight up honest: This show is going down the drain as I speak. Unless they fix it up real fast, unless there is only 24 episodes the number of episodes is still unconfirmed, this will be dropped soon enough because I’m starting to get sick of it. It may simply be the animation of it, it may be the actual storyline, I don’t know what it is but a lot of things deceive me in it, one in particular. The main arcs are TERRIBLE -_-‘. So far, with this one there was a huge buildup and it looked really awesome but now that we’re in it I’m not getting what I want and I’m seriously not into it. 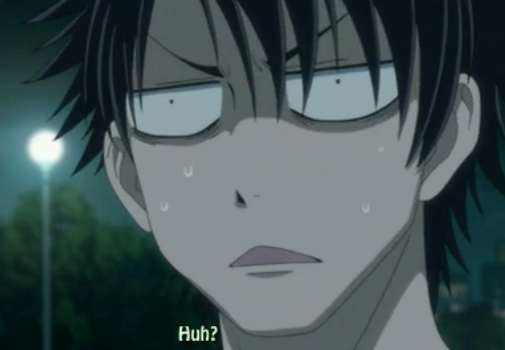 First off, Tojo seems to have some kind of really weird personality and I still haven’t figured out much as to exactly why him and Oga are fighting. I know it’s all because Tojo wants a challenge, and Oga wants Baby Beel back, but to be honest, the storyline is told very badly and I tend to forget about that part, because other things keep being meddled in with the story. In this episode, for example, there was no point in having Oga fight and beat Tojo’s “underlings”, except maybe to prove that he was cool. Even then, the fights were terrible and there was nothing badass about the fight, so what was the point? Moreover, the way Baby Beel went back to normal was way too fast and once again it destroyed the whole suspense of the last few episodes. Oh noes, Baby Beel is in trouble! Oh noes, we need to go and get him, and fight Tojo! Well look at that, Oga comes in and Tojo gives him the baby right away, moreover it gets cured from its sickness in 2 seconds and a half. Bye bye suspense, bye bye anything. Now it’s obvious that Oga will beat Tojo, he has Baby Beel with him, and we can’t even say anything looked badass like it was supposed to look because it was just that terrible. 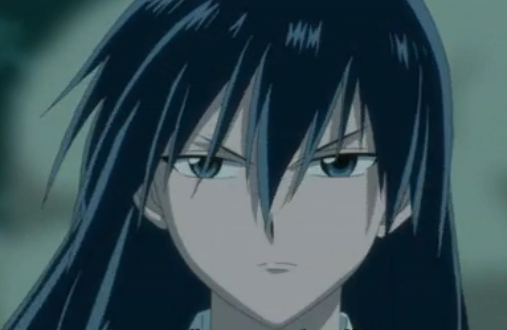 The only good thing about this episode was Kunieda’s appearance, really… -_-‘ I think she’s the only one so far that managed to look awesome, cool and badass all the time. Unless this show ends with the Spring Season, I will drop this soon enough because I’m incredibly disappointed with the main arcs of this show. Facial Expression of the Week If there’s one thing in this show that’s worth it, I think the facial expressions count for it. 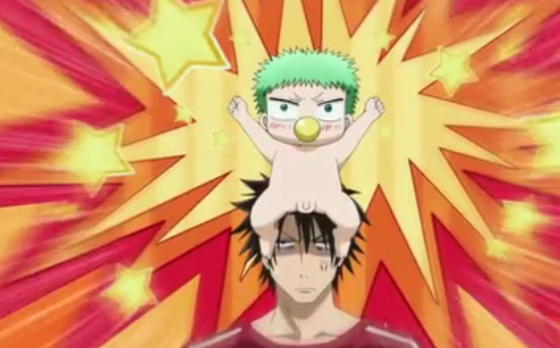 Tagged anime, beelzebub, episode 20, review. Bookmark the permalink.